8 October 2008, at 11:08a.m. US – The US Poultry & Egg Association's Poultry & Egg Institute held its annual Poultry Production and Health Seminar in Nashville, Tennessee on 17-18 September. Live production managers, service technicians and allied supplier representatives attended the seminar to hear the latest ideas for maintaining optimum bird health and performance in the face of rising fuel and feed costs, and other health and production issues. Topics of discussion included an 'Industry Economic Outlook' presented by Dr Paul Aho of Poultry Perspective. 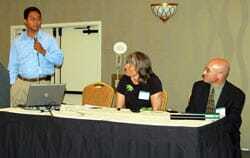 During a panel discussion 'Disease Update: What's Prevalent in Your Area? ', Dr Louise Dufour-Zavala (Georgia Poultry Lab Network), Dr Dan Bautista (University of Delaware Lasher Lab) and Dr James Barton (The Poultry Federation Lab) discussed poultry health concerns in their respective areas, then fielded questions from the audience. The program included a three-part session on Poultry House Efficiency. Dr Ken Macklin of Auburn University presented 'Litter/Bedding Management for Pathogen Control'; Mike Czarick of University of Georgia discussed 'Energy Efficiency and Alternative Heating Methods' and Dr Bill Dozier of Auburn University addressed 'Summer Night Ventilation'. Other topics included 'Salmonella Control in Live Production' presented by Dr Don Ritter of Mountaire Farms; 'A Poultry Health and Performance Review' by Mike Donohue of Agri Stats and 'Choosing the Proper Farm Location for Sustainability', presented by Keith Moore of Perdue Farms. For a comprehensive list of the Poultry & Egg Institute’s seminar programs, click here.